If only I could afford it :( From what I understand these work well as a workstation card. In that case, the most important thing would be which applications you use, and which card is better optamized for them out of the two. That said you can't go wrong with either, and if you end up going for a Radeon VII, make sure you look into undervolting. Both of the R7 cards I've had have run below 1000mv while holding a relatively steady 1800Mhz boost clock. Power consumption is around 200w +/- a bit for the card undervolted which is great, stock voltage it generally holdes boost around 1700mhz and power comsumption was around 260w or thereabouts. With these settings it is comparable in performance to my 2080 STRIX OC overall, where the standard config falls behind a bit primarily due to throttling. I should also add temps are a fair bit lower, and thus so is fan noise. Hope that helps. Feel free to @ me if you need any help. 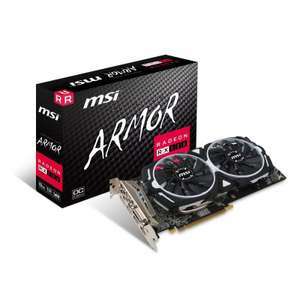 I have an rtx 2060 for gaming but am looking at a card for a workstation use which is why I'm looking at this card in particular. The huge superfast memory should come in handy. I was either this or the 2080, this seems better for my uses though. Both similar performance. Comes down to which camp you prefer. These are great once underovlted. Similar perf/watt to 2080 once done and much quieter. Any reason to get this over the 2080? Still better in £ per frame and you are comparing a mid tier chard with the cheapest 1660. People tend to be willing to pay a little more for a higher quality cooler. Even with the 1660 at £200? Or the 570 at £130? In terms of value the 580 is still the best card for 1080p. You're replying to yourself... Anyway, why do you insist I'm angry just because I think this card is inferior to other Vega 56 AIB builds? The dual fan model I linked is much better. I assume this is the review? 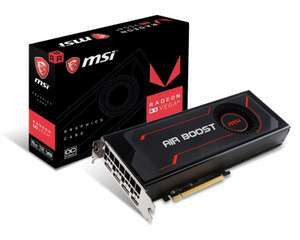 https://www.geeks3d.com/20180129/msi-radeon-rx-vega-56-air-boost-8gb-oc-review/ It's not exactly a stellar conclusion. And if you go by the conclusion... The Radeon RX Vega 56 is a solid alternative to NVIDIA GeForce GTX 1070. Both GPUs are neck and neck: depending on the test, the RX Vega 56 is faster or slower than the GTX 1070. The RX Vega 56 has a TDP of 210W but with two 8-pin power connectors, the Radeon RX Vega 56 can draw up to 375W. I set the power limit to 150% TDP (the max!) and the card has flawlessly passed all burn-in tests with a power draw close to 300W. The blower cooler is a bit noisy in load but does its job correctly. At idle, the card is quiet. The card has a backplate and the GPU tachometer (or GPUTach) is a nice gadget! The only issue with Radeon RX Vega cards is that… they are not available! This MSI RX Vega 56 is the first RX Vega graphics card I can play with. It was time! You can pick up the 1070 for cheaper and it's got 2 fans. https://www.hotukdeals.com/deals/zotac-nvidia-geforce-gtx-1070-mini-8gb-graphics-card-with-free-fortnite-bundle-22996-del-scan-3190654 Plus it has some bonus stuff with it. Anyway, I'm not saying the 1070 is a better buy, I'd suggest not buying it either. Geeks 3d say it's a solid product.l think I'll run with their opinion and the people's opinions who own the card including my own. Keep up the good work. This is not a great product. I've said why. I'm neither uncalm nor unchill. Tacavas puts up good deals, I agree, but that doesn't mean the product itself is good. I hope one day you can be impartial and not make the discussion personal. I think the main point is being missed here. For the price it's a very good deal that's why it's 313 degrees heat. Also Tacavas only puts good deals up. I really can't understand your constant arguing with other posters Nate1492 not just on this product but other products posted. I hope one day you calm down and chill. I had this card but the temp was somewhere between 88 degrees to 92 which was quite worrying for me so I sent it back. Any recent card will do that. Also quad processor doesn’t mean much. The first quad cpus 10+ years old now. If by handling you mean editing, use Blackmagic Resolve and buy this very card, as the RX580 is one of the ones they recommend. Great card if u have 24” or less monitor that has native resolution 1080 and u have no real intention of gaming at 4k. Comparable with the 1060GTX. If its just strictly for films not gaming your main priority will be noise. Most cards have can decode video decently these days. I used to have a low profile fanless card for playing blu ray films back when I had my media server. 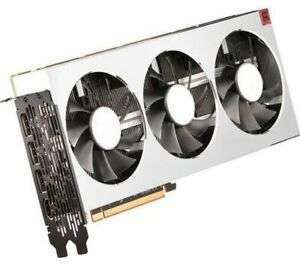 https://www.hotukdeals.com/deals/powercolor-radeon-rx-590-red-dragon-8gb-card-19999-at-ccl-3212682 Is a better card for same money. This isn't badly cooled. It's not a good card from a price to performance standpoint, as the 580 and 1660 provide better performance per pound, but the temps are fine on this card. Whats the problem with the cooling? Got one of these a couple of months back, seems to breeze through Resident Evil 2 and Devil may cry 5 when coupled with a Ryzen 2600 &amp;16gb of ram. Impressed. Never miss a 'AMD Radeon' deal again! True, this is a good price, but the card itself is a bit of a strange beast. Not really enough of a performance boost over a 580 to justify the premium price, plus it’s very power hungry. 570 is the best value/ performance currently and a perfectly capable card. If they shaved £20-£40 off the price of the 1660 I believe that would be hard to beat. Agreed. The price is more realistic now but I think I’d still take a 570/580 for the value option or Vega 56 if I had a bit more to spend and was going AMD. Especially with the nVidia options GTX 1660 at £199 and 1070 at £229. More like it. Great price for one of the better 590’s. I’m waiting for navi as expecting similar or + 10% - 15% performance to this. But for 1080p gaming this is a great price! Kind of brings it where it should be price wise. Seems by the looks of it half the posts needed replies lol. Seems like it needed a reply ;-) 344 watts of power is insane, that's almost as much as some entire PC builds use. amd is resulted 100%crap when it comes to drivers. Not been able to properly use these samsung tv at 1440p 120hz and the freesync and subsequent made up custom resolutions, 1time works and another time it does not. Not a single issue with nvidia and with same tv(obviously without FS). I'd just get the sapphire at £629 if you really wanted one, there is no difference between any of them. do you get the free games with this retailer? That depends on the application used. These any good for video production ? Thought the game offer ended 6th April? I.e. you had to have applied by then. Looks like they have removed the banner on the page now? 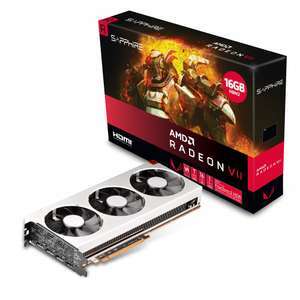 Good price for this exact model of card but seriously have no idea who is buying an RX 590 and overlooking the much better value of the RX 570/580 while not buying a Vega 56 instead - must be a really strict set of buying requirements! Good price for a good model card. Still might be worth holding on until July for Navi as I expect similar levels of performance or better with updated technology. In the case of a card like this I appreciate the cooler is a bit 'budget'. However, XFX DO seem to bin the chips somehow, as I doubt they take a chance with the high end cards which seem to be the fastest you can get. (apart from the fatboy friday p.m. rush job cough cough, ) So it seems reasonable this chip and cooler is a decent match at the price point. Basically all their cards are made to last, the sort of solution I can give away when I am done with it. (Likely involve zip ties and a couple of pwm case fans with this one, I dont think it has easy swap fans). But it says something that they wont work with Jensen. I would only buy XFX or Sapphire cards for myself, btw. XFX are a quality supplier. I'm not keen on the design of their coolers these days but they perform well and as a company, they have decent CS. yes, according to lat i looked on the tonymac site rx cards have OOB support on most o/s's. Was in same situation, had a 5850 1gb! I picked up a Nitro+ version of this card about 6 weeks ago after hearing about the generation switch. It’s a very good card. I only play ESO really and this handles it brilliantly. Was really surprised at how good this card is for the money. If I wanted something cheap to tide me over for a few months, CeX have decent cards for peanuts usually, I’m sure I saw an R9 270X for £60 in there if you don’t want to buy another RX 570/580. My 8gb 580 went kaput last week after 9 months - thankfully got a refund from Amazon. Was gutted as I was gonna upgrade when Navi came out, and all ive got spare to keep me going until then is a 1GB fanless 6450 from an old HTPC.. This is perfect in the meantime, im sure 4GB will be ok if I turn down a few settings. Thanks OP. That would never have been honoured. I have this card too. Really pleased with it and the auto undervolt setting in AMD settings is really useful. £250 is a great price. Technology has come a long way I'd like to believe. The fan on this card is quieter than my RX580 which had a dual fan and was overclocked out of the box (sapphire Nitro+ edition). Its nothing compared to a console fan. I actually don't find this too loud. In any case I try to use headphones whenever I game. But yes frame rates are constantly over 100 on my ryzen 7 1800x 16 GB RAM machine, max settings on most games. The oc Air boost model has a slightly higher clock speed otherwise they appear to be the same. I really did sit on these deals too long trying to decide, seems the free games has gone for most cards now :( for some reason this card seems about the last one to offer free games, I'm guessing since it's a blower reference card it'll be no different to the airboost ones floating on here lately (but free games offers ended on them) I'm torn, but I feel like the deal for free games might be gone after today. With just how much faster the 1660 is over the 1060/580, it's very much worth looking out for the 180-190 priced 1660s. 20% increase for a small price bump is worth it. I've tried to put prices on the cards. 130-150 1060/580 180-200 1660 220-230 1660ti But we've got 2 things coming up at the low end of the numbers. The 1650 is launching April 22nd. https://www.techpowerup.com/254228/nvidia-geforce-gtx-1650-availability-revealed This should compete at the 150-160 range. The good news? This will drive the 1060/580 down even further. The other possibility is the computex announcement for Navi on May 27th. This may be a paper launch, or something nice. It really depends, I wouldn't personally rush to buy a 3+ year old GPU right now though. How has AMD managed to keep this absolute rubbish myth alive for so long? https://www.tomshardware.co.uk/amd-nvidia-driver-updates-performance-tested,review-34465-13.html Conclusion: As expected, new video drivers increase frame rates in most titles, but the differences are often subtle. AMD averages a 2.3% speed-up across our benchmark suite, while Nvidia averages 4.3%. In some games, you will see noticeable improvements, with frame rate boosts as high as 15%. But in others, the change is so modest that you might not notice it. It's unlikely that a driver update will make a game that was formerly sluggish or unplayable suddenly run well on the same hardware. Which graphics card comes out ahead in this experiment? Whether you count the overall improvement from 2016 to 2018 or tally the total number of average frame rate wins, Nvidia's GeForce GTX 1060 6GB bags the greatest number of victories. That's why AMD followed up its Radeon RX 480 with the RX 580 less than a year later. That's right, after 2 years, AMD averaged 2.3% increases while NVIDIA averaged 4.3% increases. This is *not impressive for either side, especially AMD*. Why do we keep suggesting that AMD will 'improve over time' and Nvidia will 'degrade'? This is an unsupported myth that seems to be randomly brought up with no basis. Let's put it to bed once and for all. See, now you hit on another problem, Nvidia driver efficiency goes down for older games as time goes on, some games can easily go from 70FPS down to 60FPS on newer drivers which support the latest games whereas AMD seem to be the opposite with FPS actually coming up a bit over time. I think at this point, just buy whatever you're happy with, that's the main thing. Yes if you play everyday for 4 solid years. I will agree you will at this point in time you will get more performance from the Nvidia card. But as driver optimization for Nvidia's old cards slows it will loose much of that advantage. But either one makes sense.